While all of these little moments give a reprieve and can be good for our sanity, it can often take us away from the joy that our kids can give us. We get sucked into the screen world to escape the hard and miss the wonderful in the process. The ability of kids to change their mood is a huge lesson us adults can learn from. When the hard comes take a moment to start over and change your mood. Our favorite change is switching to silly. Luckily my kids are great at this. When I am tempted to search out something online to distract me from the hard, the difficult, the less glamorous side of parenting, I force myself to pull out the silly - usually in the form of a book. Of course, my kiddos are more than glad that mommy is going to read with them and silly books? 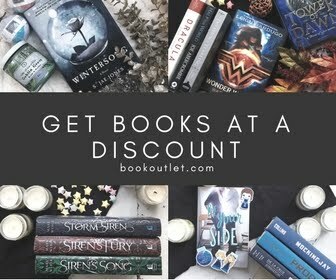 Well, who doesn't love a silly book? 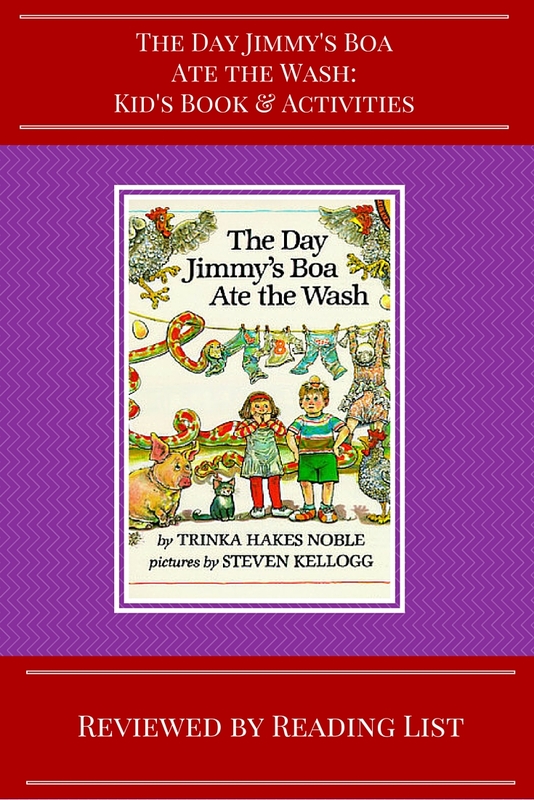 Now that the oldest is in grade school, and the next one is preparing for school next year, we have pulled out The Day Jimmy's Boa Ate the Wash ** - an extraordinarily goofy story about one girl's field trip to the farm. 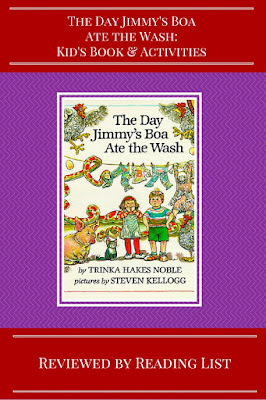 The Day Jimmy's Boa Ate the Wash follows one girl's recap of her school field trip to the farm after her mom asks about her day. This little girl is clearly a wonderful story teller as she begins with telling her mom the trip was boring. The mom wants details, and the little girl launches into a colorful description of what happened at the farm. Clearly she is concocting a whooper of a story, and the mom knows - yet the book is just plain silly. It is sure to capture the silly in your kids and keep them laughing throughout the book. My boys just love the idea of a bunch of kids at a farm throwing eggs and pigs on the school bus eating the students' lunches. The illustrations throughout the book are full of silliness and details which capture kid's attention no matter what. Another bonus is this is a great book to help encourage your young reader to build their confidence. Most of the words are basic sight words, a few words directly related to farms that could stretch their vocabulary slightly and only a handful that will challenge them. Also, the illustrations take up the bulk of the pages so there are not many words on each one, another great indicator of an emerging reader book. As a bonus, this book allows a great change to show your kids the concept of cause and effect, as each step into this amazing story results in a new chain reaction. Each new effect needs an, even more, outrageous fib to complete the whole story. While the book does portray a young girl who is clearly willing to tell a crazy lie to her mom, it also shows that parents are not as easily fooled by their kids' stories as a child might think. The mom is clearly allowing her daughter to tell her about her day, yet she is not convinced. The book is a great way to discuss how when we tell lies it results in a lack of trust. But mostly this is just a silly story that is sure to light the mood no matter the downward spiral you might have gotten caught up in the day. 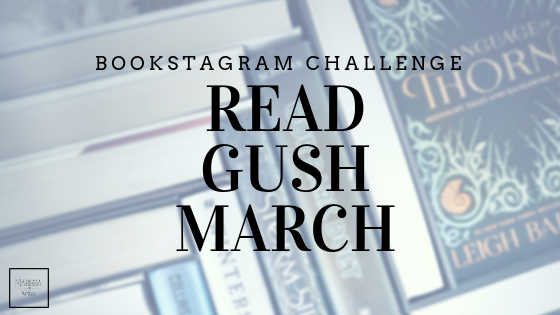 Have you read a silly book in order to brighten up a rough day? Do your kids enjoy silly books? If so, what is their favorite?